Photo by Andrew Leong, courtesy of the Cowichan NewsLeader Pictorial Newspaper. Vista Radio’s on-air team in Duncan, BC, got out from behind their microphones last month to celebrate Canada’s Family Literacy Day. 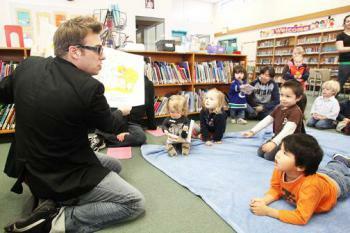 The show hosts and newsies from 89.7 Sun FM travelled around the Cowichan Valley, reading to kids throughout School District 79. Morning host Jim Jackson went to Alexander Elementary, Road Show host Troy Scott (pictured) was at Bench Elementary, reading the book Silly Sally to a kindergarten class. News Director Natasha Riebe visited Crofton Elementary, while reporter Liz Craig went to Chemanius Elementary. Alex Aitken Elementary was visited by Sun FM @ Night host Naomi Christie, and weekend/Sun Runner host Mandy Winters read to students at Drinkwater Elementary.